It’s been said that in Canada there are two seasons – winter and patio. Well folks…it’s grill time! To be honest, for Nelson, every season is grilling season. He even keeps a shovel at the back door so he can shovel a path to the bbq all winter long (and it’s a long season in Canada). But there’s something special about the first few barbecued meals of spring. There’s something in the air, I think. Heck, we’re even seeing our neighbours out and about again–as if we’re all coming out from hibernation. Yesterday was going to be a fairly busy day for us so Nelson made the marinade early and left the chicken soaking in it to absorb all those yummy flavours while we went about our day. Now, there’s definitely nothing wrong with chicken kabobs on the bbq (the marinade takes it from chicken to chickyum. But something amazing happens when you add in Portuguese sausage (called chouriço). Add flames…and bam! We enjoyed the kabobs with a tossed salad and home-made dressing. Simple and simply delicious. Daniel says, “Yum!” Enough said. We hope you enjoy. These Marinated chicken and chouriço are juicy, full of flavour and delicious! In a large, whisk together everything except the chicken to combine all ingredients well. Add chicken pieces and mix very well to coat all. Make sure chicken is submerged in the marinade. Start up the grill and make sure it's hot. I usually set mine to medium and close the lid. While the grill is heating up, prepare the skewers alternating between chouriço wheels and the chicken cubes. Before grilling brush the grill with vegetable oil to prevent the meat from sticking. 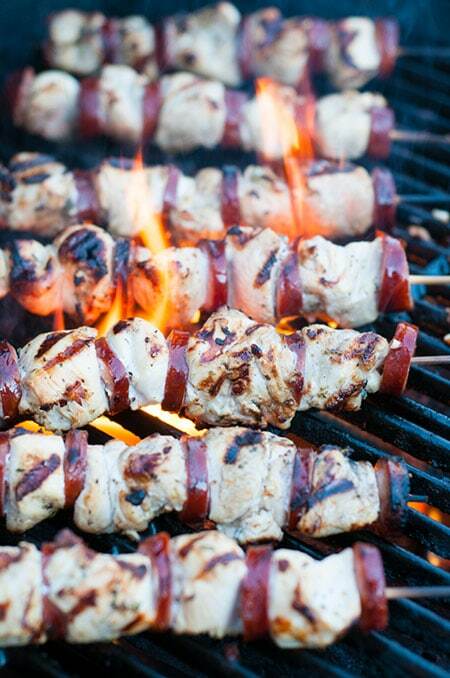 Lay the skewers on the hot grill and close the lid. After about 2 or 3 minutes, open the lid and flip the skewers ½ way to start cooking the other side. Continue to rotate the skewers every 2 to 3 minutes until all for sides are are cooked. Close the lid after each rotation to keep the BBQ hot. Cooking time varies between 12 and 15 minutes. Always handle raw chicken carefully and avoid leaving it out raw for extended periods of time. Discard the leftover marinade. This simple caution will keep everyone safe from salmonella bacteria. I use a propane BBQ in this instructions.